‘ They’re not here.” I said. Now this wasn’t Jurassic World. No dinosaur had ripped out its own embedded thermal imagery device and was running amok on a central American island. But these hybrids were potentially ‘assets out of containment’. These were pigs. Four young weaners, acquired only the day before. They’d looked very at home the previous evening, roaming around their paddock, nibbling at vegetation, sniffing at their new hut and appraising their dinner of soaked organic barley, grown in the very field they were standing in. But this morning? No pigs. Nada. I looked up at the wider field, beyond the electric fence. It’s a big field, sown to all sorts of organic crops designed to promote bio-diversity. Four little pigs could take a lot of finding in that field – most of the crops would be twice their height. I drove around the perimeter of the field. Periodically I stopped to check for movement, the kind of movement that four small Large Black crosses would make if they set off in single file across a 40-acre meadow. Nothing. The field was almost surreally still, seemingly the first day without a stiff breeze for a month or two. A deer stood in the centre of the field, just her head turning gently to mark the progress of the Land Rover as I orbited her at a discreet distance. Would she still be here if wild pigs had been rampaging across her field? Surely not. Could they have crossed the road? But the sheep were grazing peacefully on the other side, a picture of pastoral contentment. No sign of the kind of panic that a piggy expedition would have caused. No phone calls to report four porkers trotting up the C40. That left only the Forest. I shivered. Could they have walked through the field, burrowed under the sheep netting and broached the Forest in just those few hours since supper time? Had I completely mistaken their laid back approach to life only 12 hours earlier? Were they now roaming hundreds of acres of Wild Wood? Would they become mythical beasts of local legend? When hikers and bikers tore into the Ox and croaked for double brandies would Helen nod sagely and console them with the words. 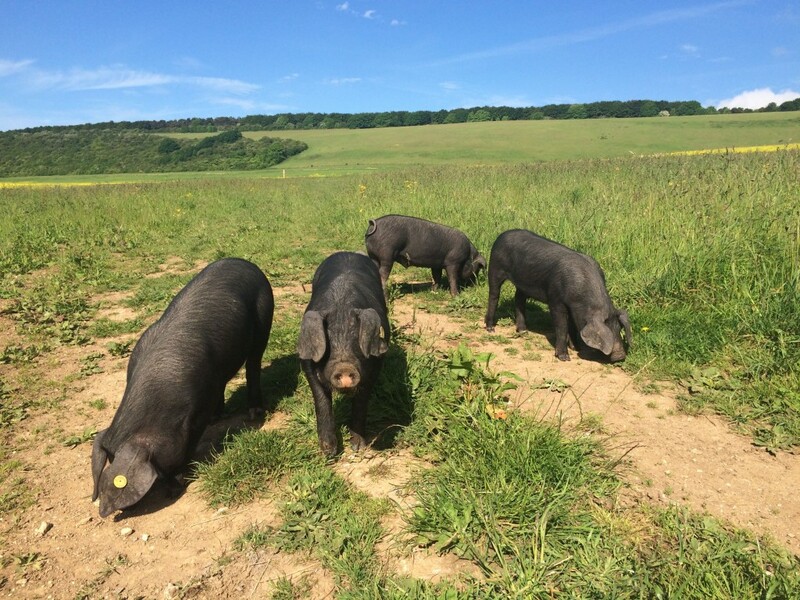 ‘I see you’ve met the Large Black Pigs of Jevington.’ Oh, it would be all my fault! I called John. He sounded …amused. ‘Are you sure they’re out?’ he asked. ‘Of course I’m sure,’ I insisted testily. ‘Look again,’ he said again. So I looked again. And there they were, curled up all together, sunning themselves, fast asleep. They were hidden so completely in the long grass that I almost trod on them before I saw them. They woke up with a start when they saw me, screeched and scattered in all directions. We’re not quite used to each other yet. She eyes the camera, a seen-it-all-before look of polite boredom, thoroughly unimpressed with her table of trophies and the frilly rosettes carefully pinned to the billowing tablecloth. By contrast he seems ill-at-ease. Is he ashamed of his muddy wellington boots? Is he wondering whether she’s about to make a break for it, and will shortly toss her forelock and turn up her hooves in an ecstasy of pent up frustration, crashing into table and silverware and leaving a scene of devastation behind her? Or is he simply camera shy – more at home in the byre than the back garden, and waiting patiently to be told that the shot has been taken so that he can return the young heifer to her stall and fork the sweet hay reward into her manger? Look carefully round the Ox and you’ll see that new photographs have been slipped into vacant spaces on the walls of each room. 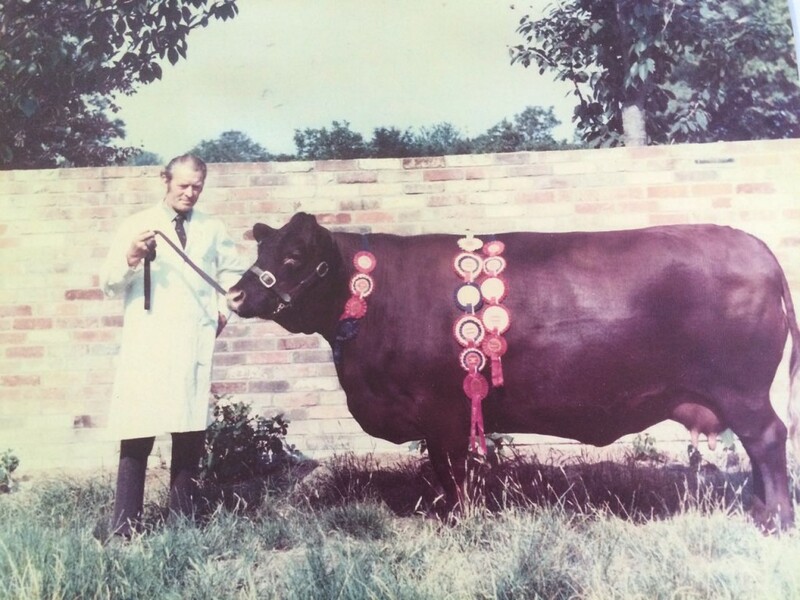 They span a century of Sussex cattle showing, and document the hours spent in grooming and halter training, the long months debating the correct feed and housing, and the years and quite possibly decades of attention to pedigree and breeding. The photos capture that pride in the beast at her best. My favourite of them features a man in his white showing coat, the halter held lightly and gracefully in his right hand, his left tucked laconically in his pocket. No fear here that his companion is contemplating mischief. She stands proud, perfectly poised and balanced, a girdle of brightly coloured ribbons draped delicately over her shoulders. An almost perfect bovine rectangle, her back so straight you could play snooker off her. They are ready to stand there all day so that the photographer can pay her all due respect. There is no doubt that this is a partnership, albeit that this day it is an unequal one. Look into each of their eyes and see the quiet assurance of the cow and the humility of her servant. We would like to thank the Sussex Cattle Society for so kindly lending us their archive to reproduce.